The Classeq ECO3 was particularly popular with pubs and restaurants thanks to double skinned doors to reduce heat loss and lessens noise in operation, which made it great for front-of-house installations. It was a powerful entry-level large sized glasswasher that could clean up to 600-pint glasses per hour using a standard 500mm basket. Removable rack guides and wash chamber door also allowed easy cleaning and simple service access. 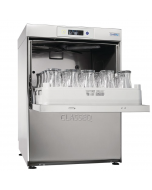 However, the Classeq ECO3 glasswasher fell short of many of its competitors' thanks to manual switchgear, mechanical dial controls and a lack of WRAS approval, meaning it should never be used as a dishwasher (or even as a hybrid for washing crockery saucers, plates or cutlery. 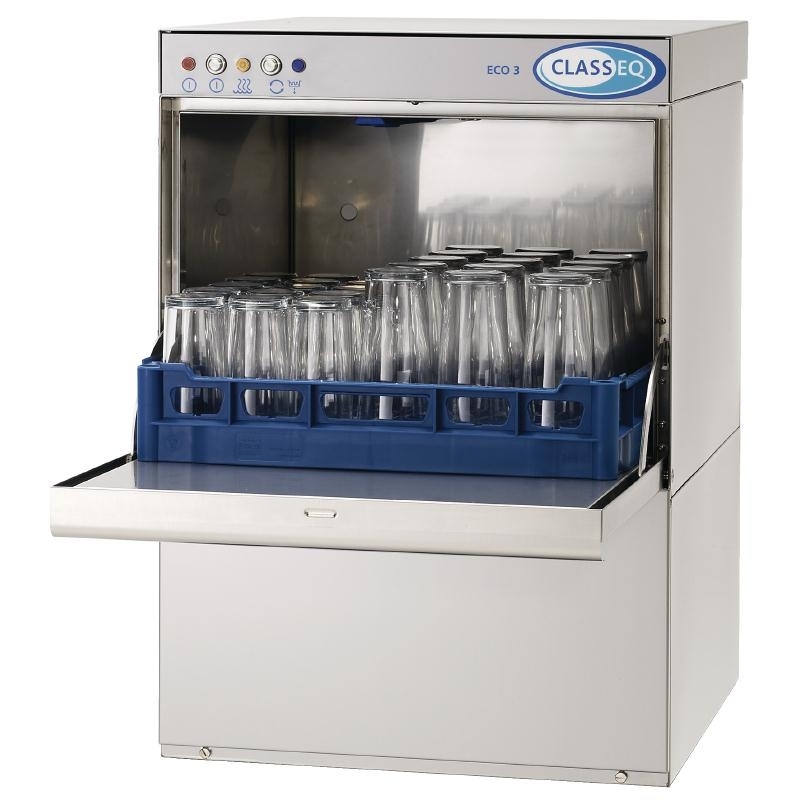 Introducing the Classeq G500, a direct replacement for the deprecated ECO3 glasswasher. Completely re-designed from the ground up, the Classeq G500 provides a simpler more effective glass washing system. Lessons have been learned from the dated look and feel of the ECO3, and now the G500 offers sleeker and more streamlined design. Finished in higher grade stainless steel, the G500 surpasses the Classeq ECO3 in terms of quality. On top of the design, practicality for catering establishments has been addressed. Unlike the ECO3 glasswasher, The G500 now features WRAS approval, which is great news for restaurants, bistro-pubs that want to wash both glasses and plates. Technology has become paramount to glasswasher design, and that’s why we see the new G500 featuring built in software that continually monitors water usage, temperature, chemical levels and wash cycles giving valuable data used to improve operational efficiency. Many of the features of the ECO3 that we knew and love remain, and the G500 still features a 2-minute wash cycle, a double skinned door providing quieter and cooler operation, hot or cold fill options, integral automatic detergent and rinse aid pumps. One wash cycle will fit 20-pint glasses in the 500mm basket and can run 30 cycles in one hour, that’s 600-pint glasses per hour meaning the G500 is still more than equipped for the busiest pubs, restaurants and catering establishments. Bars, pubs, clubs and restaurants with a Classeq ECO3 glasswasher that are looking for a direct replacement should undoubtedly consider the G500 on their next upgrade. It provides all the necessary features operators have come to know and love, with some innovative new features that make it far more practical, and better looking for front of house environments! Those with a slightly higher budget may also consider the G500 DUO edition glasswasher, which adds even more features such as digital temperature display (for added safety) and options for integral water softeners (for added practicality).